About a week before Jessica’s birthday, I asked her what kind of cupcakes she would like for her birthday, and since Jessica does everything cute and fancy x1000, she did not request vanilla cupcakes with vanilla icing. She did not even request chocolate cupcakes with chocolate ganache. Oh noooooo. She (of course) requested a combination of things I have zero experience in. Jessica requested chocolate salted caramel cupcakes. As if making vegan caramel anything wasn’t challenging enough, she also mentioned that her party was Adventure Time themed. If you (like me) are not a watcher of this cartoon, you probably don’t know how difficult these characters would be (for someone with little to no artistic talent) to draw with icing. Challenge 1. Creating a recipe from scratch that includes vegan caramel. I don’t even really know what caramel is supposed to taste like since I think I’ve only had it one time in the 13 years I’ve been vegan. This is how I knew I needed to recruit a non-vegan helper to be my taste-tester/helper-elf/kitchen-slave. Luckily, I ran into Terence the week before Jessica’s birthday at the Octogala, and offered him a trade, which he shockingly* accepted. The agreed upon exchange was that I would assist him with the birthday card that he was making for Jessica, and he would assist me with the cupcakes. Little did he know that I unknowingly manipulate people into assisting with 34764059 more things than they originally commit to, because I always make the mistake of thinking that I can turn 6 hours into 12 somehow. 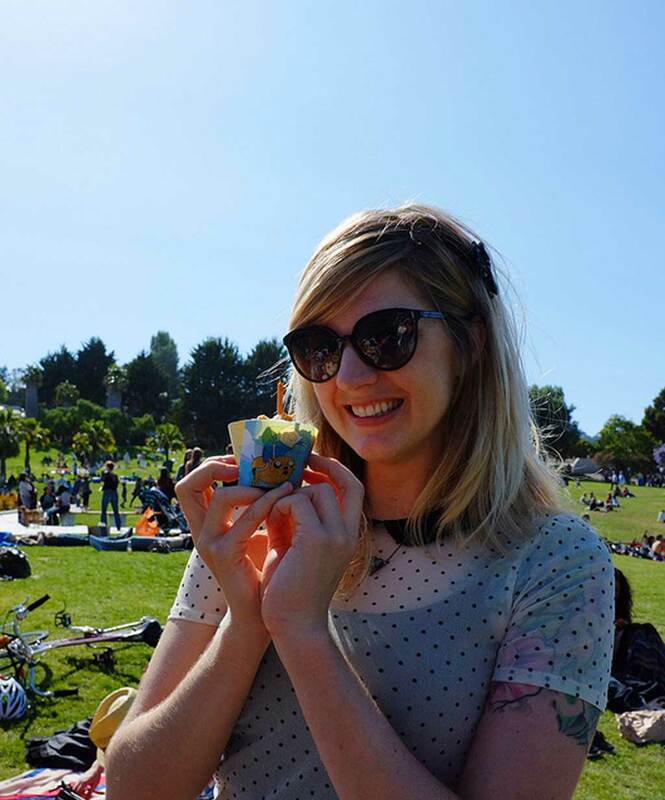 So, 2 days before we planned to meet up, we were chatting online about cupcakes and such, and I reminded him that Jessica’s adventure-themed birthday was taking place in the form of a picnic at Dolores Park. While Terence wanted to make some fancy salad that he had ordered at a restaurant a few nights before that, I was trying to stick with the theme of “cute” which if you know Jessica, you would know that this should be (and is) the theme of everything in her life. So, we settled on these as an alternative to Terence’s fancy salad. And of course, because I (think I) have that oh-so-special ability to somehow squeeze 12 hours out of 6, we also made the following. And that is not all. Oh no, that is not all. 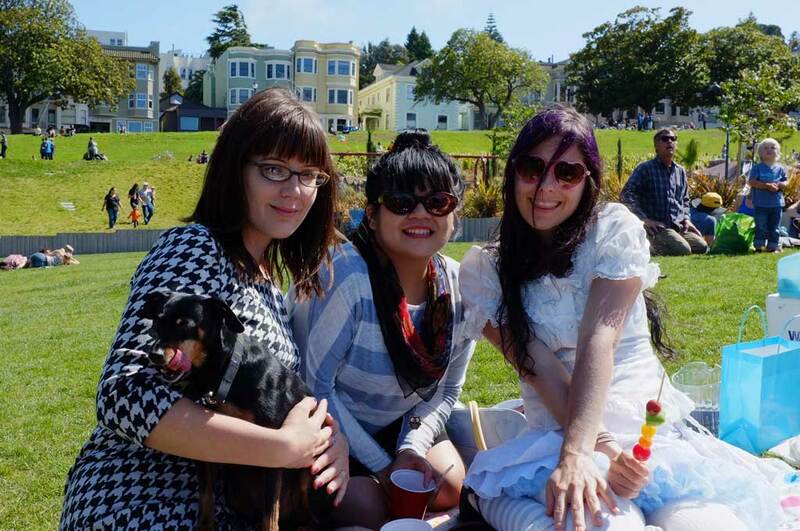 So, I remember quite a few years back (the day of the missing spoon that I will never ever forget), Jessica had another birthday picnic at Dolores Park (maybe it’s one of those traditional birthday party themes that gets reused every few years), and she made spam musubi. 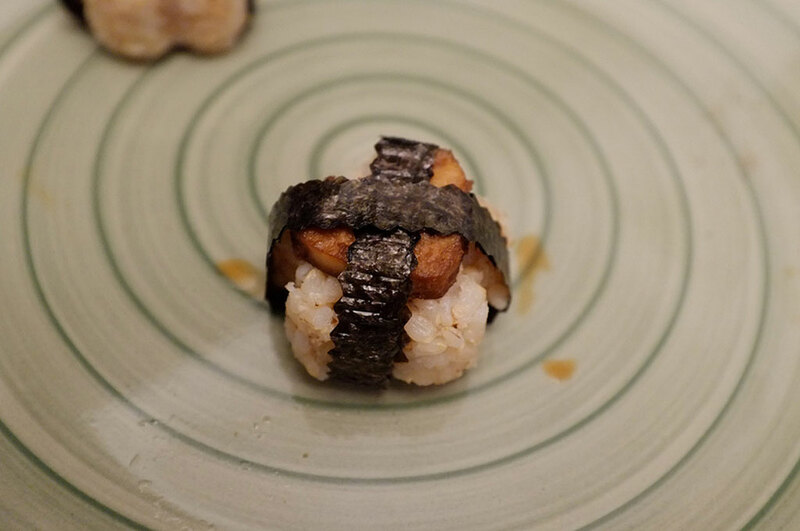 I had never even heard of musubi, but she went to the trouble of making a vegan version for me (on HER birthday! Isn’t she the sweetest?! 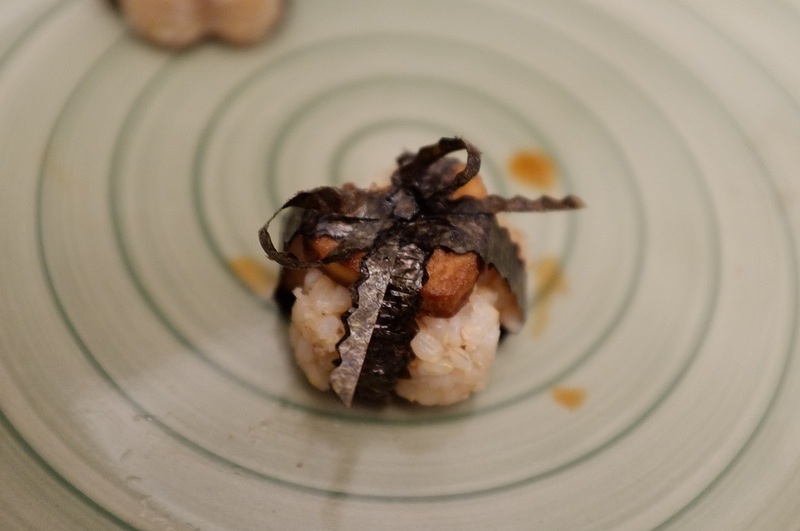 ), and I have to say, I have loved musubi ever since. Then when I visited her in Hawaii, we went to a vegan restaurant that made spam musubi, and it was soooo good. So, in the spirit of tradition, Terence and I decided to invent a vegan spam musubi recipe because all the recipes I found online sounded awful! 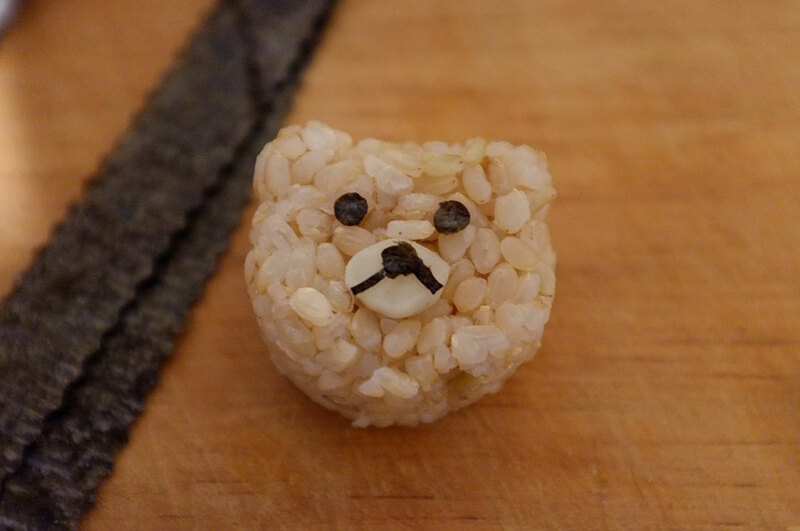 Normally, musubi isn’t exactly what one would call cute, and we had already decided that everything we make for Jessica’s birthday has to be cute, so here’s a step-by-step tutorial on how to make “cute” vegan spam musubi. Steam 1 cup of rice. Then make your spam (recipe). 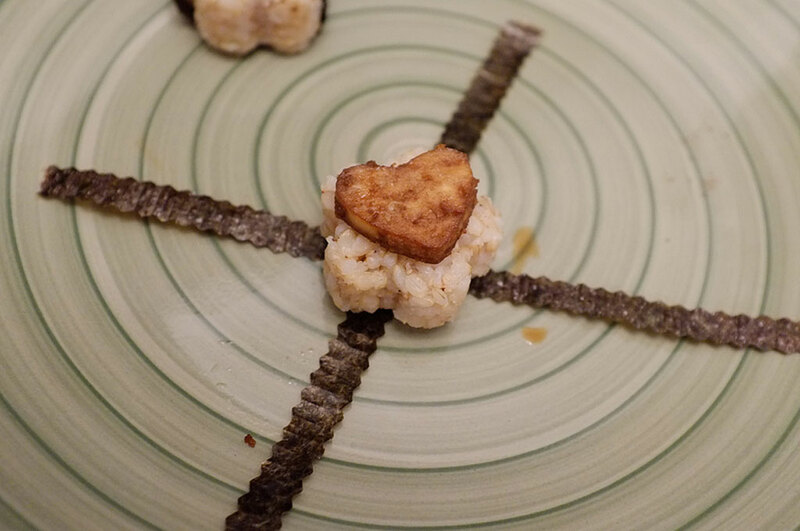 While the spam is cooking, season your rice however you usually season it for sushi (I added rice vinegar and sesame seeds), and press it into cute shapes that you can find at Diaso. Terence and I used flowers. If you have fancy scissors, you can cut nori strips with cute edges, but normal scissors work fine too. 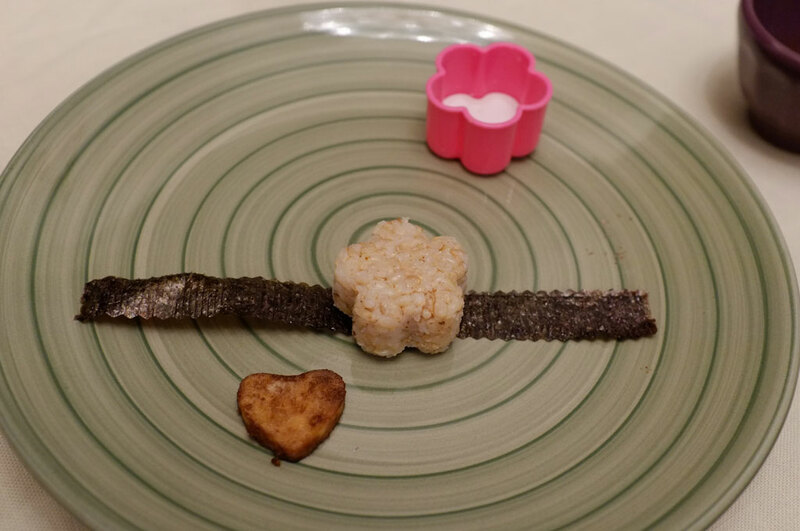 Place 2 strips of nori, set your rice flower down, top is with a spam heart, and wrap like a present. What’s a present without a bow? No present at all! Terence also has this skill that I had never heard of before called plating. 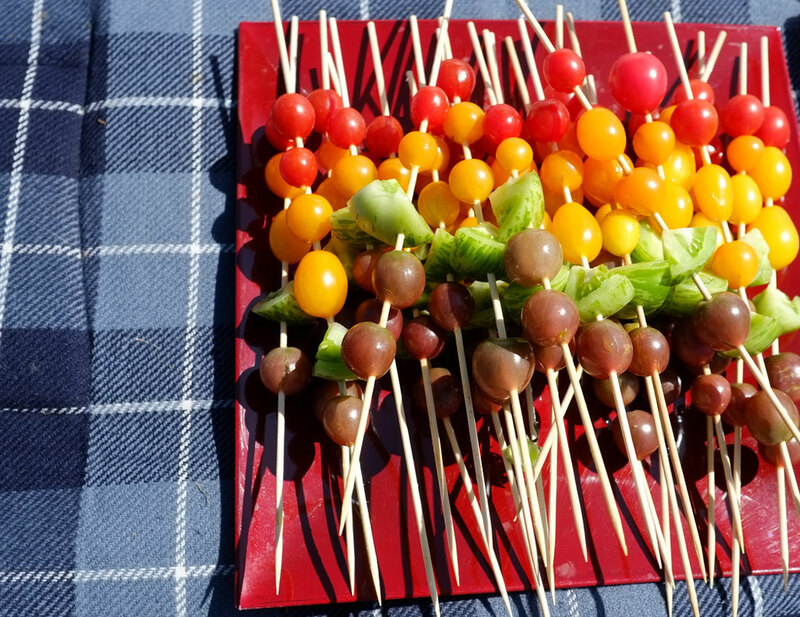 So, he was in charge of all plating for this event. 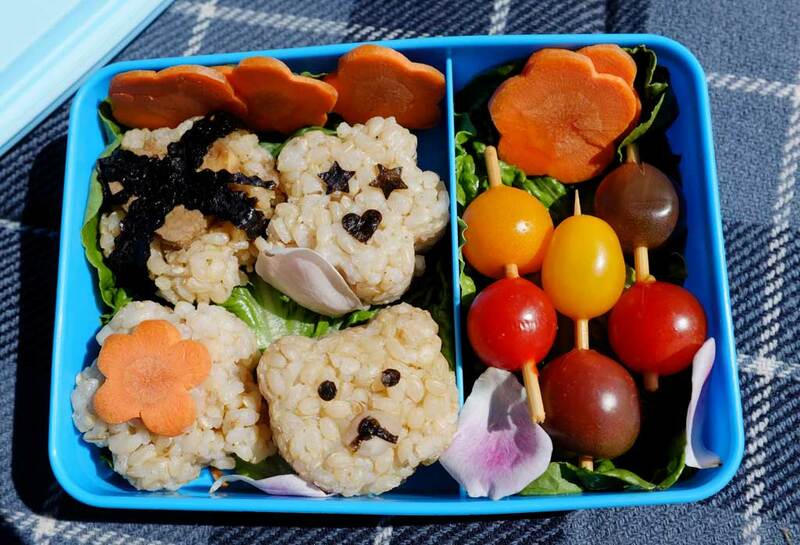 Look at the personalized bento box he plated for Jessica. So, this was the part of the night where I came to the harsh realization that I actually DO NOT have the ability to squish 12 hours of activities into 6, and everything started going badly. Maybe not bad… let’s just say that making vegan caramel was a bit more challenging than I had expected. The first batch got thrown away. The second batch ended up becoming too hard and turned into caramel candies instead of caramel sauce. At that point I was so exhausted that instead of attempting a third time, we then decided to sprinkle the candies on the cupcakes and sprinkle the salt and pretend that it was perfectly just the way we planned for them to turn out. Challenge 2. How to make them Adventure Time themed at 3am. Thank goodness for Terence or I would have disappointed poor Jessica, arriving with plain ole chocolate salted caramel cupcakes, undecorated, looking like they didn’t even belong at the party. Terence made his first ever cupcake cozies with the 2 main characters from Adventure Time. Our plan worked! Everyone at the party love them including Jessica and that’s all that mattered.